Steve Smith explains how to implement several possible file synchronization paradigms, to make the processor easier and more logical. Included are file backup methodologies to prevent file loss. The challenge, synchronizing multiple computers. We have more than one computer, and by that logic, we have files on one computer, that we'd like access to, and access to the latest version, to be more specific. So, the question is, how does one synchronize files between computers? Knowing the majority of you will like to have the ability to sync your files, or have access to a bank of update files from anywhere, you will want a simple solution. Since the most complicated part is figuring out how to synchronize your files, we need to work with a few different paradigms that make the process of synchronization logical and more efficient. In each of my paradigms, you, also, have remote backup possible. The most important issue you will notice is that all the computers have to be powered and connected, in order, to synchronize the files unless we use a cloud drive or NAS drive. 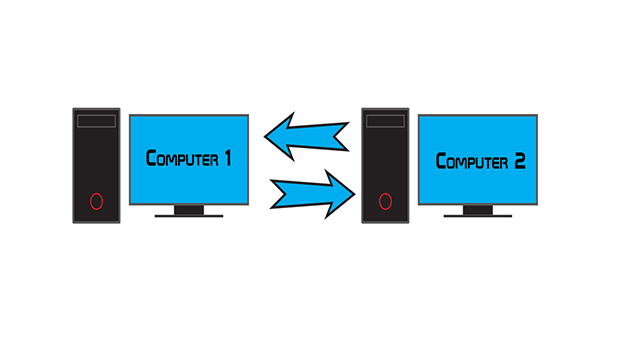 In Figure 1, both computers on the same network, where the primary computer hosts the majority of the work, and the secondary computer synchronizes the files. The primary computer may, also, be connected to the cloud to add an extra layer of backup. 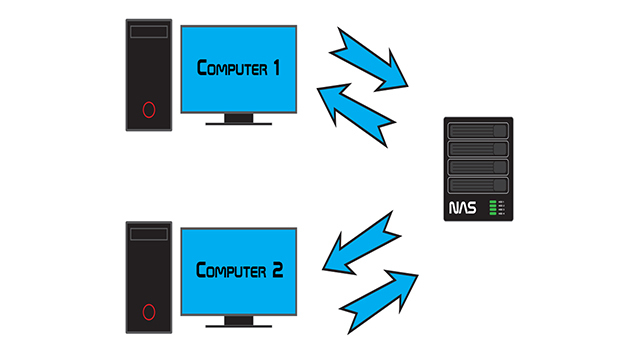 In Figure 2, the primary and secondary computers both synchronize with the NAS drive, or use the NAS Drive as a central point for file access. Because the NAS Drive is more likely to be on, each computer can access the latest version of the files, regardless of the status of the other computers. The NAS Drive can, also, synchronize a backup in the cloud to allow for an extra layer of backup. If we refer to Figure 1 and Figure 2, we can use programs such as Good Sync, to synchronize the files from one computer to another, or from one computer to the NAS Drive. 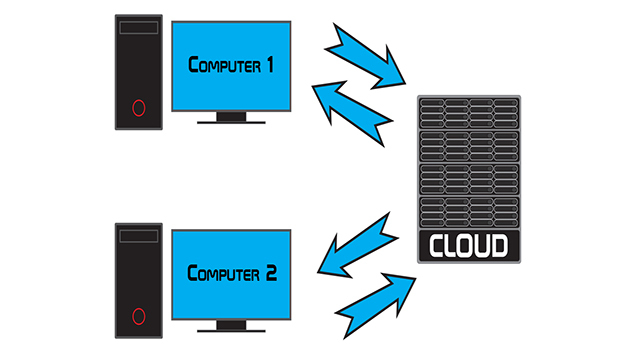 In Figure 3, we use the cloud itself to synchronize files on every computer. This means that there is no requirement to leave any computers on, and allows for the access to the files to occur regardless of location. This, also, doubles as a backup, as it is not in the home. It is possible to mix and match each of these three paradigms, however, simplicity is going to be key. The last thing you want is a never ending synchronization to occur, an infinite loop, if you prefer.